Another Tea Partier re-joins the GOP……..Rand Paul…. Primary Republicans run hard right…. General election come back to the middle right…. Just as Sharron Angle is doing in Nevada…. Rand Paul is coming home to the GOP….. Even though Senate Minority Leader Mitch McConnell stood with the GOP establishment candidate in his home state of Kentucky, he will now host a June 24 fundraiser in Washington for Paul hosted by the Republican Senatorial Committee, according to the Louisville Courier-Journal. Back home in Kentucky, Republicans were trying to knit back together Paul’s movement with the wing of the party that backed Secretary of State Trey Grayson, the Lexington Herald-Leaderreported. There are lingering resentments from the primary. The paper said that some Paul supporters feel the Grayson camp “drove the wedge deep” by not only challenging Paul on policy differences but trying to portray him as a candidate with fringe ideas. On the other side, some Republicans who have had a stake in party activities for years are feeling pushed aside by impatient Tea Party movement activists. 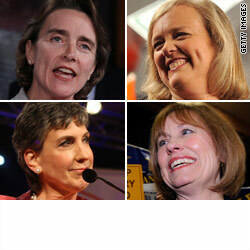 Women have a very good day June 8…….Lincoln, Whitman, Fiorina and Angle win their primaries…. When I went to sleep last night it didn’t sink in on me that it was strong female night…..
Again…..Am I ever happy to call a race wrong with voters doing the right thing, YES! Both where able to spend large amounts of money in their campaigns….. But they will both put up good fights…..
She is going to get battered ……. We’ll see if her positions ring true with the general voters on that state…..
All in all not a bad day for the Democrats in general…. Rob Simmons WILL drop out of the running for the Connecticut US Senate seat as a Republican leaving Linda McMahon to run against Richard Blumenethal …. Rob Simmons will hold a press conference for this morning in New London to announce he’s leaving the U.S. Senate race, sources said late today. The former congressman and Vietnam War veteran lost the Republican convention’s endorsement on Friday to former World Wrestling CEO Linda McMahon. Simmons entered the Senate race in the winter of 2009, when a politically ailing Sen. Christopher Dodd was the preumptive Democratic nominee. Throughout the spring and summer and into the fall, Simmons sat atop public opinion polls. Then McMahon entered the race in September and began spending millions onf television ads and direct mail…. Meanwhile the Blumenthal campaign has released results from an internal poll that shows him up on McMahon by 15% points……..
Today Blumenthal’s campaign released an internal poll showing him ahead of likely Republican nominee Linda McMahon 55 percent to 40 percent, even though 91 percent of respondents had heard about the controversy regarding his statements about Vietnam. Last week the Republican-leaning pollster Rasmussen found Blumenthal ahead of McMahon 48 percent to 45 percentand leading former Representative Rob Simmons 50 percent to 39 percent. Not only could Blumenthal still win this race, he may still be favored to win. Charlie Cook declared this race a “tossup” just after the New York Times story broke. ScottP…….Midterm Elections and The GOP…….Hispanic Voters in Az and Co…. I do think that during the midterms the GOP is going to do better than they have recently in western states like AZ and CO. So they will think that their decision to double down on the aging white demographic is working. But that will be due primarily to angry white voters being the disproportionate % of those who turn out in midterms. In 2012 they will be hard pressed to win those states and others with similar demographics in a Presidential year. “In Colorado and Arizona, Public Policy Polling sees Hispanic voters swinging dramatically towards Democrats in the wake of Arizona’s new immigration law. 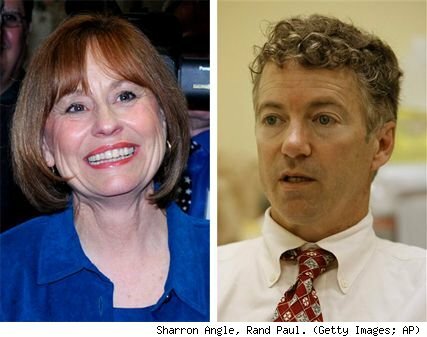 While Republican Chairman Michael Steele clashed this weekend – Senate Minory Leader Mitch McConnell (who endorsed Pauls opponent Trey Greyson for the primary may 18th) now endorses last weeks statements by Kentucky Teaparty candidate for Senator Rand Paul. U.S. Sen. Mitch McConnell, who had endorsed Grayson in the primary race, called for Republicans to unify behind Paul in the general election and to reach out to Democrats. “Dr. Rand Paul’s message can win this election,” McConnell said. In the few days since Paul became Kentucky’s Republican senatorial nominee, his message has been … before he went into hiding from the national media, that is … that businesses should be able to discriminate based on skin color, that making buildings accessible to the disabled is too much of a hardship, that the minimum wage could cause unemployment, and of course that the government should leave poor British Petroleum alone. Which message does Mitch McConnell think is a winner? Republican's stop the Wall Street Fianace Bill….for now…. The GOP will hold tight …looking for concessions in the bill….. The president again will have to personally step in to get it done….. This is Healthcare all over again….drama….but it’ll get passed….. This is the way of the US Congress…. Republican’s stop the Wall Street Fianace Bill….for now…. Republicans will try to pick off Tea Partyer’s by bringing them into the fold….. In Nevada, the Clark County Republican Party is opening a phone bank in Las Vegas later this week specifically for Tea Party members to conduct voter outreach, party officials said. And from Tennessee to Arizona, Republican candidates are turning up at Tea Party-sponsored events to rail against government spending. The debate over healthcare and the stimulus program galvanized conservative activists to become politically active much earlier this cycle. “I think the RNC should be talking about those issues and making sure that the Tea Party folks know they have a home at the Republican Party,” said Chip Saltsman, a Republican consultant who ran for the RNC chairmanship last year. Observers note that the lack of a robust party infrastructure to capture the Tea Party’s energy could hamper the GOP’s chances in November. Democrats don’t have fond memories of the 2004 cycle, when groups such as America Coming Together (ACT) and MoveOn.org drained money and volunteers away from Democratic campaigns. The liberal groups worked to defeat President George W. Bush and other Republican candidates, but they frequently duplicated the party efforts and were ultimately unsuccessful. Republicans will try to pick off Tea Partyer's by bringing them into the fold…..